The method of threading your bobbin may vary depending on your sewing machine, so check your manual. Some machines have an automatic bobbin that just pops in place. Others require a bit of fiddling. With a top drop-in bobbin, you simply open the casing, drop the bobbin in, then pull the thread to one side, so it passes through the tension hook. When you’re finished, replace the cover. With a front-loading machine, you want to open up the hatch and remove the bobbin casing. 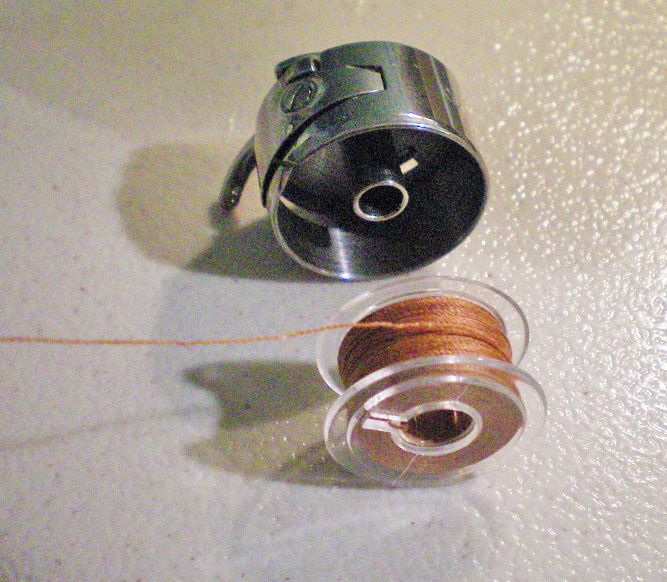 Pop the bobbin into the bobbin case, with the bobbin turned so the thread unwinds clockwise. In other words, if you pull from the left, it will unwind from the top. Pull the loose thread into the bobbin case’s tension slot. 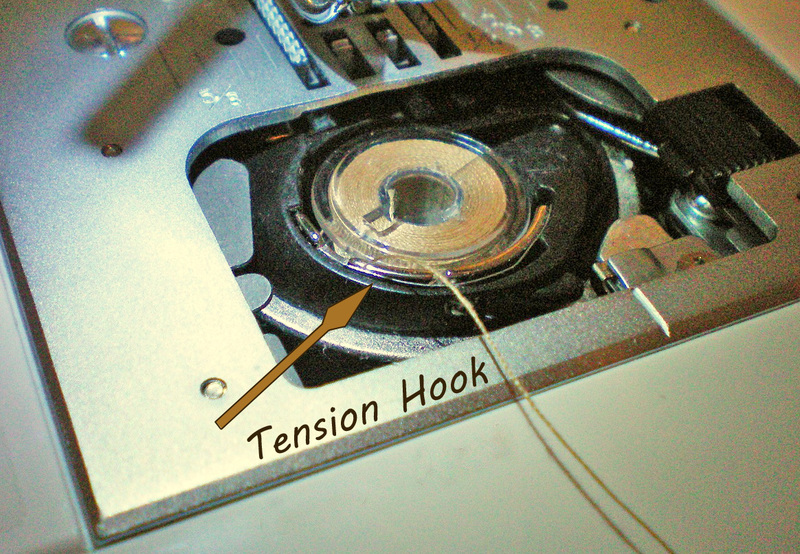 This is an important step, as the tension is what keeps your thread from looping and being too loose when you sew. It’s very rare that a bobbin’s tension needs to be adjusted, but if you’re having trouble with your thread looping, go ahead and test it. Hold the bobbin case by its thread. Gently jerk upwards, like you’re playing with a yo-yo. If the thread unwinds and the bobbin drops a few inches, your tension is perfect. If the thread doesn’t unwind at all, your tension is too tight and will need to be loosened. If the thread unwinds freely and the bobbin drops quickly, your tension is too loose and you’ll need to tighten it. 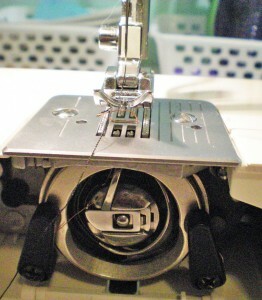 To adjust your bobbin’s tension, use a tiny screwdriver and turn the screw on the side of the bobbin case by 1/4 turn. Test the tension again. Repeat until the thread only drops a few inches. To keep the bobbin from falling out of its case while you’re inserting it into the machine, pull the little lever on the back of the case. This locks the bobbin in. (Note: This doesn’t always work with plastic bobbins.) Holding the case by the lever, insert it into the machine and rotate it until the bobbin case finger lines up with the corresponding notch inside the sewing machine. The whole case should slide into place like a puzzle piece. The next step is to pull the thread up. 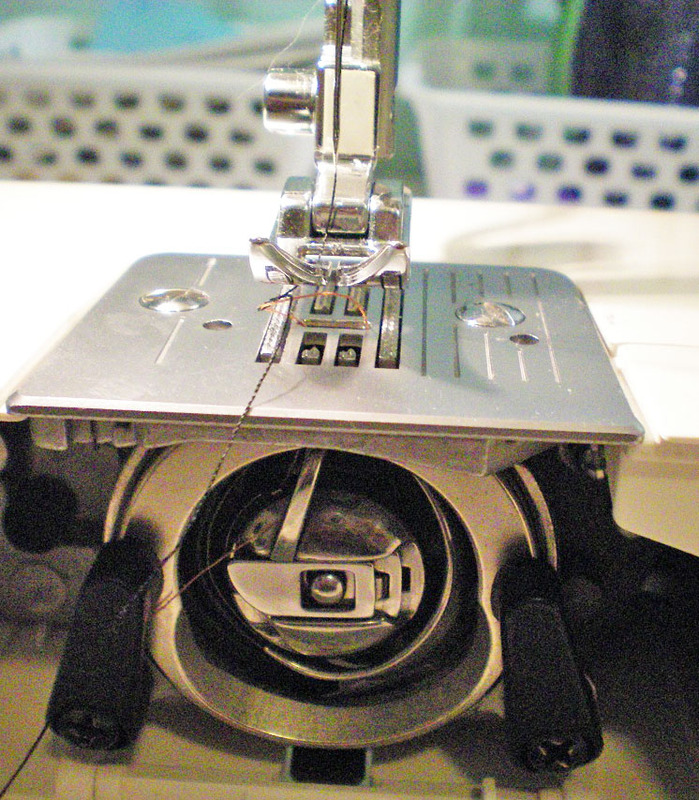 The method is the same regardless of whether you’re using a top drop-in bobbin or a front loading bobbin. Make sure your needle is threaded. Pull the thread toward you and hold onto it while you slowly turn the hand-wheel. When the needle comes back up, the upper thread will have looped around the bobbin thread. Tug gently on the upper thread and it should pull the bobbin thread up through the throat plate. Use something like an awl, a crochet hook, or a seam ripper to carefully pull the loop of thread out. 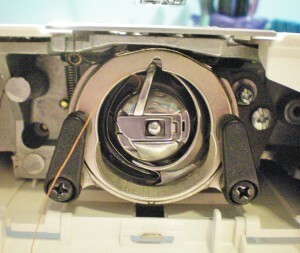 Take both threads and tuck them under the presser foot, toward the back of the machine. 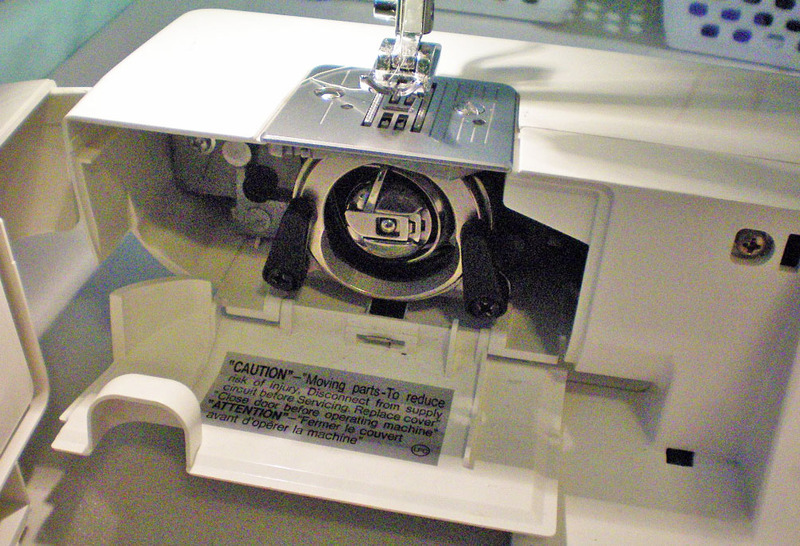 Close the bobbin hatch back up and you’re ready to sew! Does your bobbin thread differently? Do you have any tips for easier threading? I have a Kenmore sewing machine and seam to have two problems with it. After the top thread is caught by the hook it gets on top of the bobbin and get caught on the bobbin stop. Second the bottom side of material thread look like a bird nest.